Be strategic with bylines. Byline articles or essays on an issue or topic, carrying an exec’s byline, that are pitched and placed for publication in media are often a core of a thought leadership program. But these pieces pack more punch when timed strategically within a company’s overall PR efforts. For example, if your B2B PR plan includes a new product launch in email marketing software, it pays to push that piece on new best practices for email marketing a week or so after the product launch, when the buzz is still fresh and interest and engagement is likely to be higher. Collaborate on ideas for written pieces. Collaboration is key to crafting the most high-impact written pieces, whether bylines or speeches or messaging for a website. As the expert, you have the authority on what’s most current in the field, but working collaboratively with your PR partners will ensure the angle or narrative is most relevant and media-friendly. And needless to say, a byline in a relevant industry publication is a great complement, and in some ways works harder than, your own blog post. Host an intimate, high-impact panel. This is the ultimate way to “own the conversation” and control the message, since you’re the host of the entire event. Focus a panel discussion on the topic closest to your heart, to showcase the depth of your expertise and invite coverage. Be sure to document everything. Your PR team can then turn the assets into byline articles and white papers after the fact, in addition to generating media coverage, as we did here for a client after a successful event. Be selective about speaking engagements. Once a baseline level of expertise and visibility is achieved, you can expect inbound requests for speaking engagements to start coming your way. It can be tempting to say yes to everything, but we see “speaker fatigue” setting in quickly among thought leaders, leading to diminished value for the time invested. 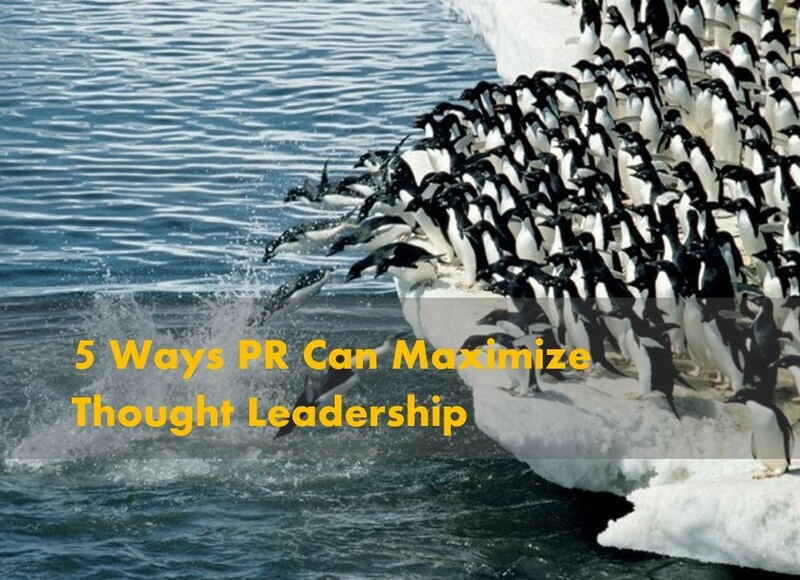 The key isn’t in numbers, it’s in speaking to the right audiences — a key question PR likes to keep top of mind. Write the book. Not everyone has the material to write a book, but if you do, publishing a book has never been easier than it is now, especially if you’re open to self-publishing. Among other advantages, being the author of a new book is a calling card PR can use to create fresh media opportunities.